About Us - River Arts Inc.
River Arts Inc. (RAI) was formed in 1997 and in 1998 became a 501(c)3 non-profit organization that served as the capital fundraising organization for the Sauk Prairie community’s River Arts Center. When that charge was complete in 2000, the organization restructured itself as an arts presenter. River Arts Inc. produces an annual performance series in the 500-seat theatre in the River Arts Center as well as curates multiple art exhibits in the 1700 square foot River Arts Center gallery adjacent to the theatre. 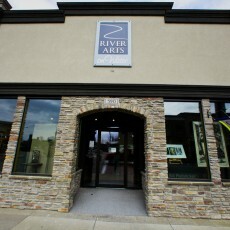 The organization moved its administrative office and ticketing outlet to the River Arts on Water gallery in 2011. Opened in 2011, River Arts on Water is a beautiful space on the banks of the Wisconsin River in Prairie du Sac, Wisconsin. 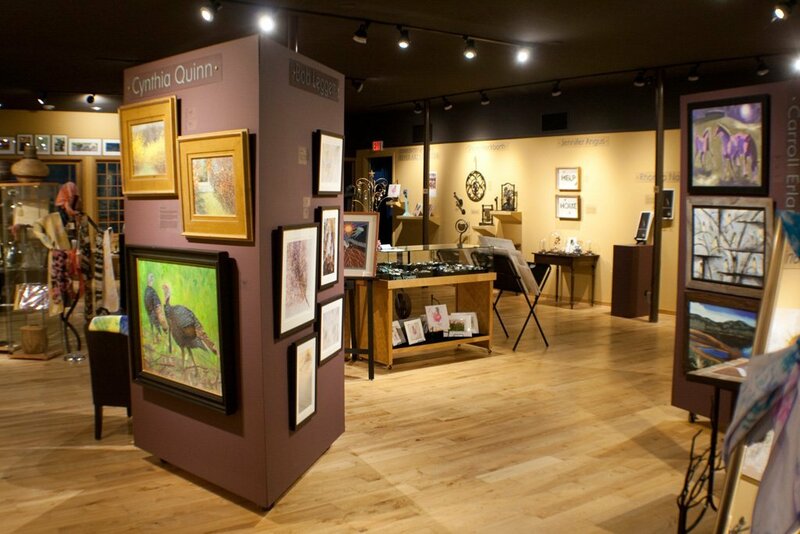 Devoted to the cultural and ecological vitality of the community, it is a retail gallery, concert, and gathering place operated by River Arts, Inc. In 2017, thanks to tremendous community support, River Arts Inc. became owners of their downtown property and now offer art workshops in the Studio for all ages. Discover the fortunate rhythm of Sauk Prairie here. History of River Arts, Inc. The prospects for a performing arts center in Sauk Prairie looked bleak after three failed referenda in 1995 and 1996. But a serendipitous conversation between Mr. John “Dusty” Koch and his patient, Ramona Kramer, changed all that. They concluded they wanted to help revive the effort by utilizing their contacts from a lifetime of living in and serving the community. What emerged from that initial exchange was a working group that charted a course to first study the feasibility of and then execute a plan to bring a performing arts center to the community. The basic plan called for a grassroots effort to identity donors, large, medium and small, to create the funding and develop the community support for the project. River Arts, Inc., a non-profit, was to be a crucial vehicle for their efforts. It served as the organization through which the generosity of the community was expressed. From the outset the middle school and high school were to be a featured element in any performing arts program because both had nurtured interest in music and theater. Because of the community’s strong commitment to its students, and viable project needed to partner with the school system. Fortunately, the School Superintendent, Richard Magnuson, and the School Board chaired by Dr. John (Tony) De Giovanni, were strongly supportive. The combination of leadership, hard work and the grassroots convergence of these and a few other factors eventually led to a successful project. The referendum that ultimately passed included the promise of substantial fundraising from the community to which the school district would add funds. A state supplement to the building program reduced the cost to taxpayers of the community and furthered the successful referendum effort. While thousands of members of the community gave their support, the most vital contributors of money and effort were Darlene Ballweg, the Bank of Prairie du Sac, Culver’s, and those leaders like Dusty Koch, Tony De Giovanni and Ramona Kramer who imagined what was possible and then helped to do what it took to make it happen. Today, the River Arts Center, with the continuing support of River Arts, Inc., hosts performances, visual arts exhibits, community and school plays, as well as countless school district and community events. River Arts Center Gallery, 109 Ninth Street, Prairie du Sac, Wisconsin. River Arts on Water Gallery, 590 Water Street, Prairie du Sac, Wisconsin.